NATO Secretary-General Jaap de Hoop Scheffer used a June 25 security forum in Kazakhstan’s capital Astana to encourage debate on how the Atlantic Alliance can evolve in the age of globalization. He also sought to reassure cautious Central Asian leaders that partnership with NATO was a "two-way street." The two-day meeting of the Euro-Atlantic Partnership Council opened in Astana on June 24 -- the day after Kyrgyzstan agreed to a new deal with Washington that will allow US troops to remain at an air base outside of Bishkek. In his keynote address, de Hoop Scheffer emphasized that NATO’s future effectiveness will depend on its ability to adapt to changing circumstances. It was a message clearly tailored to suit the political, economic and cultural sensitivities of Central Asian states. "We need to tackle the dark side of globalization without compromising globalization’s benefits. How? By thinking and organizing ourselves differently than we did in the past. By saying goodbye to the outdated security paradigms of yesterday. And, above all, by exploring new approaches of security cooperation -- reaching out beyond geographical, cultural and religious boundaries," de Hoop Scheffer said. De Hoop Scheffer and his Kazakh hosts were at pains to stress the benefits of cooperation and play down geopolitical rivalry in the region. The secretary-general repeatedly used the word "partnership" while outlining the alliance’s strategic tasks. "Partnership is no longer about eliminating residual mistrust left over from the Cold War," de Hoop Scheffer said. "It has become a unique instrument to tackle common challenges. The organization’s priorities are now combating terrorism, drug trafficking, organized crime and nuclear proliferation, he insisted. NATO is no longer about "Cold War-style territorial defense" or "playing the role of a global policeman," he added. Central Asia itself stands to benefit from NATO’s mission in Afghanistan, he pointed out: "Instability in Afghanistan affects Central Asia more than any other region -- from terrorism to drug-trafficking. By the same token, no region has more to gain from stability in Afghanistan than Central Asia." 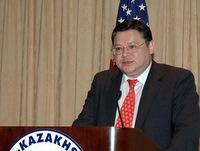 Kazakhstani officials expressed a desire to explore new forms of partnership. Foreign Minister Marat Tazhin, in a June 25 welcome speech, described the forum as a "perfect venue" for re-conceptualizing NATO’s role in Central Asia. "Central Asia serves as a kind of testing ground for trends coming from the West and the East," Tazhin said, adding that it was Astana’s desire to "creatively reconsider alternative [security] models and gradually develop our own unique regional architecture." Astana has declared regional security and the reconstruction of Afghanistan as the central planks of its agenda for its chairmanship of the Organization for Security and Cooperation in 2010. During the forum, Tazhin called for improved international coordination for Afghan reconstruction initiatives and urged a greater focus on the "non-military aspects of security." In 2007-2008 Kazakhstan allocated $3 million to Afghan reconstruction, Deputy Defense Minister Bolat Sembinov was quoted as telling the forum by the Kazakhstan Today news agency. Sembinov also said Kazakhstan was proceeding with plans to send "officers to the staff of the international forces furthering security in Kabul." Astana maintained a peacekeeping presence in Iraq from 2003 to 2008, and has expressed its willingness to send a contingent to Afghanistan. Kazakhstan has also provided over-flight rights for resupply missions to Afghanistan, and earlier this year permitted land transit for non-military supplies. In line with its policy of forging good relations with all great powers, Astana has also made diplomatic and military shows of support for Russia, which it describes as its key ally. The most recent was in May when Kazakhstan refused to participate in NATO military exercises in Georgia. The efforts by NATO representatives to downplay Brussels’ geopolitical rivalry with Russia contrasted sharply with comments made by the Kremlin’s hawkish representative to the Atlantic Alliance, Dmitry Rogozin, who made it clear that a Western security presence in Central Asia was not welcomed by Moscow. Rogozin told journalists during the forum, in remarks quoted by Russian newspaper Izvestiya, that NATO is making a mess of things in Afghanistan. "[The alliance] is too far from this region, understands nothing about what is happening there, and therefore imagines that they are having some success there, but in actual fact they are getting bogged down in the Afghan quagmire more and more deeply," Rogozin was quoted as saying. Rogozin also called on NATO to recognize the role of international bodies in which Russia plays a key part, including the Shanghai Cooperation Organization and the Collective Security Treaty Organization, in promoting Afghanistan’s stabilization. In addition, he suggested that NATO leaders were dreaming if they believed they would ever be able to establish a major presence in Central Asia, especially in Kazakhstan. De Hoop Scheffer on June 24 described Kazakhstan as "NATO’s most active Partner in the Central Asian region," but Rogozin later described Astana as Moscow’s "wife." 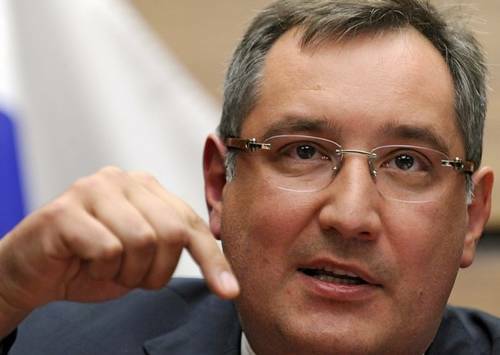 "A faithful wife has her admirers who give her flowers," Rogozin said. "That is NATO -- an admirer of Kazakhstan who gives her flowers. Kazakhstan is nevertheless linked . . . to the nucleus of the former Soviet Union and, as before, to Russia. It is impossible to compare the close, kindred, family relations between Kazakhstan and Russia with relations with other families who come and visit, bringing cakes." Kazakhstani officials did not publicly react to Rogozin’s remarks. Instead, officials promoted a couple of non-proliferation initiatives, repeating an offer to host a US-backed global nuclear fuel bank aimed at curtailing the spread of nuclear materials, and calling for the signing of a new global Nuclear Non-Proliferation Treaty. A new pact was proposed last week by President Nursultan Nazarbayev -- who did not attend the forum but sent greetings. The Security Forum opened amid upheaval at Kazakhstan’s Defense Ministry. Daniyal Akhmetov, who since 2007 had served as Kazakhstan’s first civilian defense minister, was dismissed without explanation on June 17. He was replaced late on June 23 by Adilbek Dzhaksybekov, who had been serving as ambassador to Moscow. Dzhaksybekov’s appointment is unlikely to change Kazakhstan’s overall defense policy, which -- like its foreign policy -- seeks to tread a fine line between Moscow and the West, without upsetting either one.